Leslie Thomson is no stranger to the taxing, exhausting, and sometimes thankless work of a caregiver. Leslie’s roles already included that of a mother, a wife, a foster parent, and full-time worker when her role of daughter took on a new set of responsibilities. Leslie is one of many in the “sandwich generation”, wholly devoted and spreading herself thin to take care of both her growing children and aging parents. Until she was connected with Senior Services North Fulton. Leslie’s Mother and Daughter Leslie’s story begins in 2000 when her mother had a massive stroke and was diagnosed with Alzheimer’s disease. She and her husband, Mark, decided to care for her within their home. At the time, Leslie’s daughter, Rachel, was three years old. Managing her mother’s Alzheimer’s disease, Leslie learned to live with little or no sleep. She and her husband both worked full time to afford the costs of caregiving, medical care and the additional housing costs that were incurred by taking her mother in. Both physically and emotionally exhausted, they looked for help outside the home. That is when they learned of Senior Services North Fulton. With Leslie desperate and at her wits end, Senior Services met with Leslie and asked what assistance she needed to care for her ailing mother. Senior Services North Fulton arranged for respite care for her mother so Leslie could get groceries or run errands; personal care for her mother so the financial burden of full-time caregiving could be reduced; and Meals on Wheels to help with nutritious meals and a friendly smile. 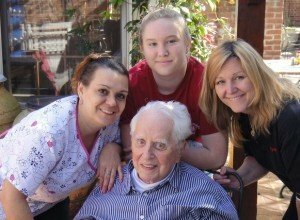 Three years ago, Leslie’s father called from California and asked her to bring him home to Georgia and take care of him as well. Leslie, now mother of two young children and still looking after her own mother, answered her father’s request without hesitation, knowing she had the help of Senior Services North Fulton. Together, they would make this happen. Both of Leslie’s parents passed away recently.